The little blue organisms lined up along the brush border of the small intestinal epithelium are Cryptosporidia. This infection causes diarrhea in immunocompromised hosts. 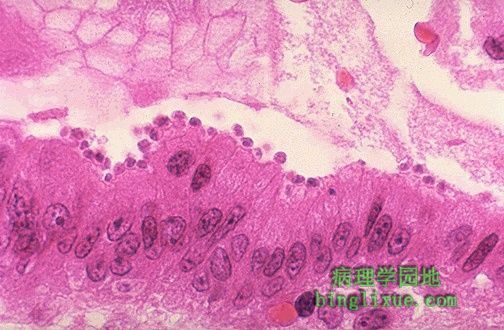 Cryptosporidium infection is best diagnosed by stool exam. Three cysts are seen in the center with this acid fast stain. 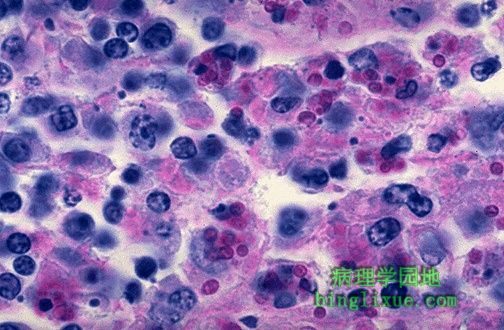 Many fungal infections can produce a granulomatous pattern. In immunocompromised hosts, the immune response is often poor, so granulomas are poorly formed, if at all. This portion of liver demonstrates some pinpoint yellow-tan granulomas in a patient with disseminated histoplasmosis. 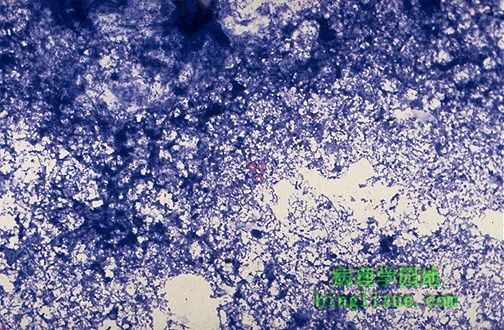 This is infection with Histoplasma capsulatum. Note how each macrophage is filled with numerous small organisms. The organisms have a clear zone around a central blue nucleus which gives the cell membrane the appearance of a capsule. Hence, the name of the organism. 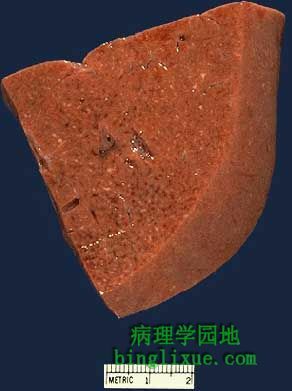 A PAS stain highlights Histoplasma capsulatum infection in the liver. 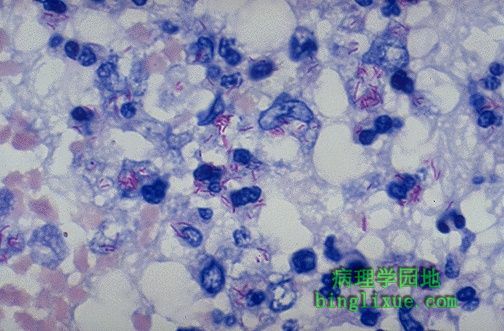 This is an acid fast stain of Mycobacterium tuberculosis (MTB). Note the red rods--hence the terminology for MTB in histologic sections or smears: acid fast bacilli. 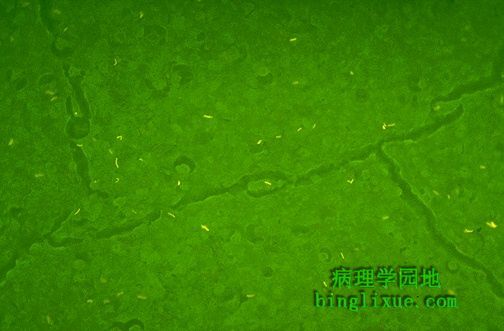 Mycobacteria can also be stained with auramine and viewed with fluorescence microscopy, in which acid fast bacilli now appear as glowing yellow rods. This method is easier to use to screen for mycobacteria and is the method routinely used in sputum specimens sent to the laboratory. 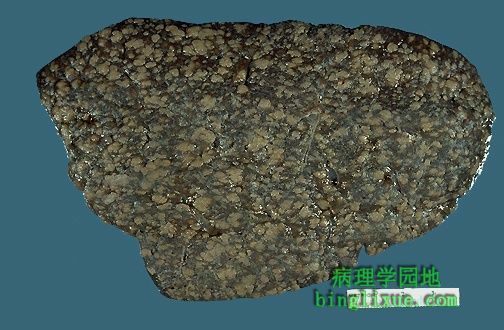 This spleen shows a miliary pattern of granulomatous inflammation, with numerous small tan granulomas. This suggests a poor immune response. This patient had AIDS. 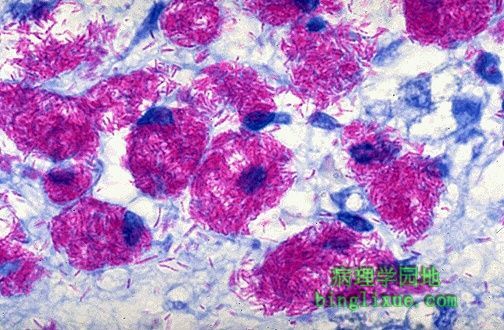 The infection turned out to be Mycobacterium avium-intracellulare (MAI), also known as Mycobacterium avium-complex (MAC). 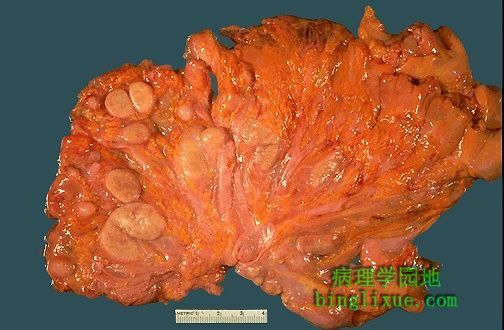 The lymph nodes in this mesentery, best seen at the left, are enlarged and have cut surfaces that appear yellow-tan. These nodes are filled with sheets of Mycobacterium avium-complex (MAC) organisms, and the immune response is so poor in this AIDS patient that there is no focal granuloma formation. 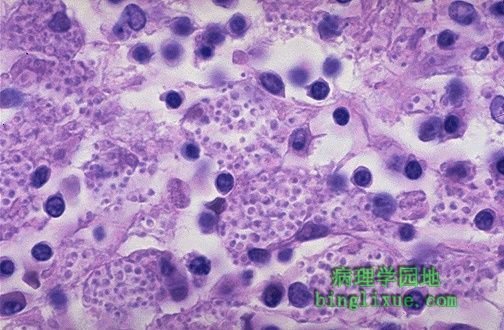 Microscopically, Mycobacterium avium-intracellulare infection is marked by numerous acid fast organisms growing within macrophages. Lots of bright red rods are seen, particularly in macrophages, in this acid fast stain of lymph node.